Once you have decided that you want a chameleon as a pet you need to be prepared for his arrival. Everything should be set up before bringing him home. You need to have an ideal cage and habitat, the appropriate lighting and heat, and the correct foods and supplements. Creating the perfect environment for a chameleon will help ensure your pet lives a long and healthy life. A large and tall screened cage or terrarium with screened top. 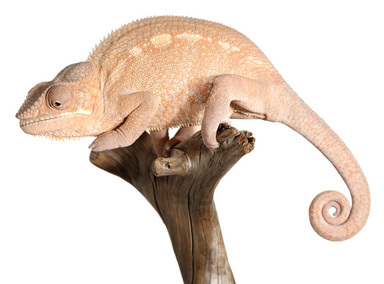 For chameleons one foot or less in length the cage should be at least 2′ x 3′ x 3′. Always go with the biggest cage possible. For cage free chameleons or for inside a cage, a Ficus Tree with many branches and leaves can make a suitable home. Horizontal branches for climbing and exploring and many leaves for hiding and resting. If you are not using a Ficus Tree, there are artificial branches and leaves designed for reptiles. UVB fluorescent bulbs that extend the length of the cage. Basking bulb or heat emitter to create heat for the habitat. Light fixtures that hold the bulbs and prevent the chameleon from getting too close and possibly burned. A dripper, mister, or fogger to supply water and create humidity in the enclosure. A thermometer and humidity gauge to monitor your pet’s habitat. A food bowl that can be attached to a branch or the side of the cage for insects or greens. Substrate for the bottom of the cage like newspaper, paper towels, or Eco-earth. If you have a Ficus Tree, a large pot and the soil for the plant can make a suitable substrate. Gut-loaded insects like crickets and mealworms. Gut loading is providing nutritious food to the insects. The nutrients get passed to your chameleon when the insects are eaten. Pinkie mice for larger chameleons. These should only be fed to your pet occasionally and always try to use pre-killed mice. If your chameleon likes to eat plant matter, you can supply collard, mustard, turnip & dandelion greens, kale, or romaine lettuce. A dripper, mister, or fogger to create droplets of water on leaves that your pet can drink. A calcium and vitamin D3 supplement.